Equity markets, nearing record highs this week, have rallied since the election of Donald Trump. In the UK, the FTSE 100 reached 7,044 on Wednesday, the highest level for two months with better than expected company earnings and Lloyds banking group helping push the index higher through the acquisition of MBNA. In the US, the Dow Jones also flirted with all-time highs reaching just short of the 20,000 milestone. Europe’s leading stock market, EuroStoxx 50, also rallied strongly, reaching its 12-month high after benefiting from a significant devaluation of the Euro. The Euro fell to a 13-year low against the US Dollar and in touching distance of parity (i.e. one-for-one) amid continued concens that the Eurozone is grappling with complex political issues which threaten stability amongst its members. For bond investors, yields have seen reversals, no more noticeably than in the US. 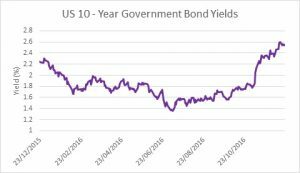 Currently, US 10-year government bonds have a yield of 2.55%, the highest point over the past 12 months. The sharp rise has been driven by anticipation that the Trump administration would implement fiscal stimulation at a time of near-full employment, raising expectations that inflation will be higher in the years ahead. A further factor has been the Federal Reserve, who in a statement issued with their recent decision to raise rates pointed to the need for 3 rate rises next year. It is interesting to note that their official growth forecast of 2.5% is broadly unchanged whereas the rate of growth desired by Mr Trump is 3.5%. This has caught the attention of bond investors pushing yields up. When bond yields rise prices fall, forming negative returns for bond investors. With equity markets nearing all-time highs and bond yields on the rise too (prices falling), there is a clear divergence in returns. This illustrates just how important diversification is for investors, reducing risk when asset classes are moving in different directions. This week the Bank of Japan held a policy meeting and from this they have boosted growth forecasts amid a pickup of exports and better business sentiment. Interest rates have been kept the same and forecasters feel there will be no more easing over the short term. Bond yields were a main topic of discussion with the 10 year Japanese Government bond rising to 0.1%, putting pressure on the Bank of Japan as this is a level many see at the upper limit of the central bank tolerance. Japan has been a potentially surprising beneficiary of the election of Donald Trump with the Japanese Yen falling as the US Dollar strengthens with a weak Yen positive for Japanese exporters. This illustrates just how global and connected markets are with a side effect of expanding domestic demand in the US leading to a reduction in exporter’s competitiveness from a stronger currency. On Wednesday, the Italian parliament approved a €20bn government bailout plan in an attempt to rescue the country’s weaker banks. This is looking likely to start with a bailout as early as next week for Monte dei Paschi, Italy’s third largest bank. In July, the bank did not pass a European Union stress test due to having billions of euros of risky loans on its books made to clients who cannot afford to repay them. The new Italian prime minister, Paolo Gentiloni, has vowed not to let the bank fail for fear that its collapse could topple the rest of Italy’s heavily indebted banking sector. It is likely that thousands of Italian retail investors, including pensioners, would be left out of pocket, because new EU rules governing bank rescues demanded that bondholders should be the first to take a financial hit. This could affect around 40,000 small investors whom are estimated to hold around €2bn of Monte dei Paschi’s bonds. So what does this mean for investment? It is a signal to markets that the Italian government and European Union are determined not to let the banking sector fail and that they are prepared to take extra measures to prop up the sector and provide stability.